A few months ago I started saving money for Brady by following the $5 rule that I stole from Whitney. When Guy and I got married we started a small automatic withdrawal to a separate savings account to save for our future children. 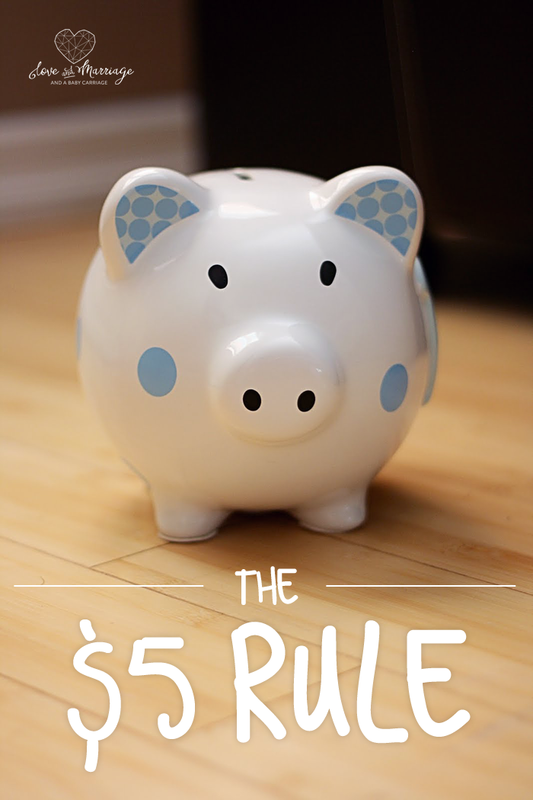 That particular account is strictly for college but there are so many other things in his future he needs us saving money for; his first car, trips, camps, braces… So that’s where the $5 rule comes in. It’s simple – every time you get a $5 bill you put it away. I have a little envelope in the small planner in my purse that I put them in when I get them. It’s too tempting to use it if it’s in my wallet. Then I fold them up and put them in Brady’s piggy bank to wait for the next time we can take them to the bank. The key to the whole process though, is getting the money into his piggy bank as soon as possible. If the money is in your wallet, you’ll spend it, if it’s in an envelope in your purse you still might spend it… but if it is in your little baby’s piggy bank? No way are you going to crack it open and pull some money out. I wonder though how we will change the saving when and if another baby comes around. Split it? Start a separate bank? Who gets what? 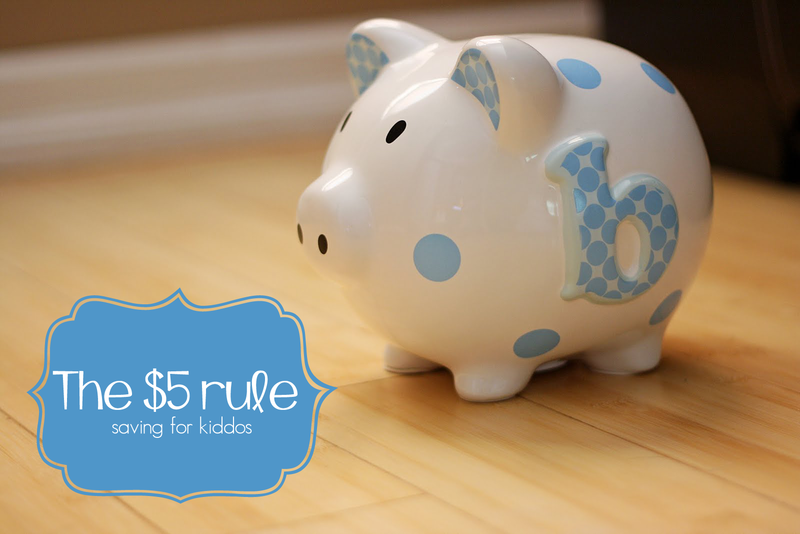 How are you saving money for your little ones future expenses? We started a 529 account for college! Its strictly for college. As of right now we have $25 a month going into there for our little Madison. When we have extra we will add to it too. We also put all our change into her piggy bank, which then goes into her bank account. That’s such a great idea!! I need to start doing that for a “rainy day” fund! So we just use the automatic withdrawal to save for my son’s college fund. But I agree, I’d like another fund for other things. He has a piggy bank that we always throw change in if we have it but I’d guess that has no more than $20 and he’s 2. A great idea for those who swipe is to always get $5 cash back when you make a purchase. Then you can put that $5 into a piggy bank.